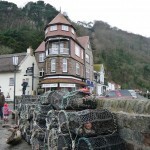 With its distinctive octagonal turret, Harbour Point dominates any view of Lynmouth seafront. Arranged on four floors, Harbour Point offers flexible and spacious self-catering accommodation, sleeping from two to eight people. 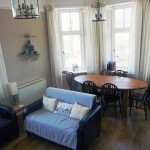 All main rooms have sea views. This Victorian property is fully modernised with double glazing. The ground floor entrance hall is ideal for storing coats and boots. 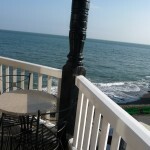 The lounge and dining area on the first floor enjoy spectacular views of the sea. 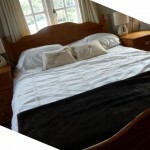 There is also a double bed settee. 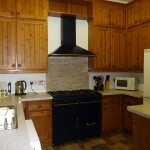 A roomy kitchen offers ideal self-catering facilities, with fridge freezer, dishwasher, microwave, washing machine/dryer and a magnificent double gas cooker. There is also a wc on this floor. A second flight of stairs takes you to two bedrooms, both ensuite with shower, pedestal hand basin and wc. 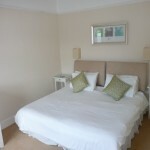 Both bedrooms can be configured as either a twin bedded room or a super king size double. The first bedroom has its own balcony with commanding views of the sea and harbour. 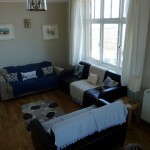 The second bedroom also has lovely sea and harbour views. On the fourth floor, with magnificent views, is the octagonal turret with its 4-poster bed and lace canopy. It has four aspect windows offering panoramic views of the sea, the harbour, Countisbury Hill and the village of Lynmouth. There is also a pedestal hand basin, a Victorian slipperbath with shower over ( in restricted space ), and a separate ensuite wc. With direct access to the South West Coastal Path you can enjoy long coastal and woodland walks. 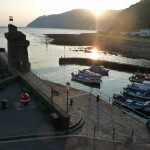 Bustling with visitors by day, Lynmouth becomes a quiet, sleepy village by night. 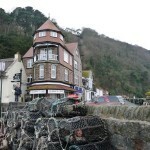 There are two pubs and several restaurants to choose from plus more eating places in the nearby Lynton. Combe Martin and Minehead are within a few miles drive. Close by are many sporting facilities including golf, fishing and surfing and North Devon also has a large number of family attractions within a short drive. There are numerous arts and craft shops, museums and railways. Exmoor is a haven for wildlife where you can see the famed wild ponies, red deer and birds of prey.